After the rush of September events, it was nice to get back to just another relaxing weekend of paddle trail maintenance on Bayou Fountain. With the ribbon cutting for the launch coming up on October 15th, we want to make sure everything is just right. It was a fairly easy paddle trail maintenance run this time. There was a pair of trees down right at the giant drainpipe downstream of Rackley Bridge, but they were relatively spindly and didn’t take too long to dispatch. Basically, a quick hour’s work, and we were on our way. Of course, the expedition was not uneventful, as at one point a giant creature of the deep found its way into my boat and proceeded to threaten me with grievous harm. 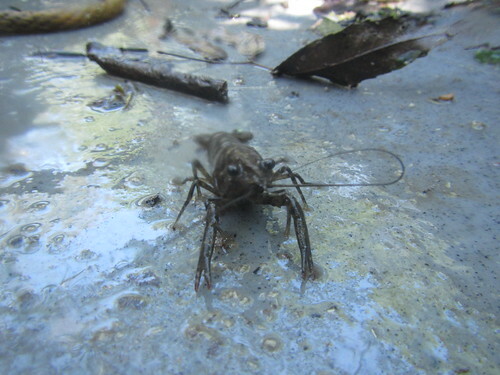 Okay, it was just a little stowaway crawfish, but don’t tell him that — he was doing his best. It wasn’t all crawfish and turtles and trees (oh, my!) out there this time. 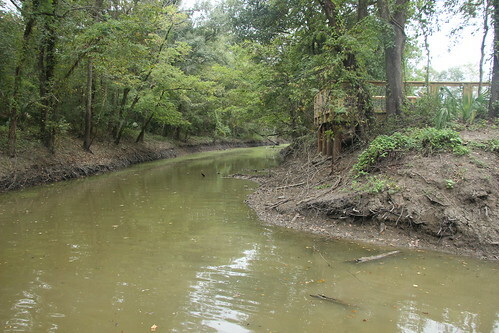 We were on the return leg, paddling back to the park from Bayou Manchac, when all of the sudden a fast moving dark object shot toward the bank and then loped up it and into the woods just upstream of the Not-So-Great Wall of Fountain. We spotted another otter! We’ve seen otters out on Bayou Fountain before, and while sightings are rare, there’s always a chance you’ll catch a glance. Our official September rainfall in Baton Rouge was apparently 0.08 inches, and the lack of real rain has the bayou way down. 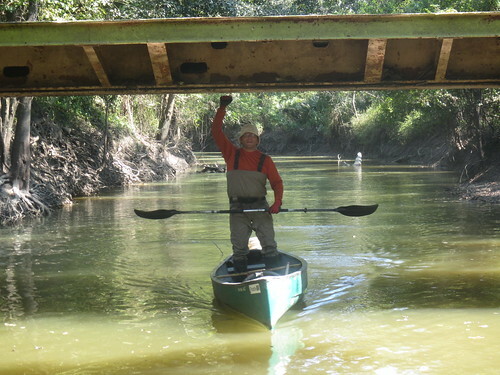 You don’t have to worry about portages or ducking as you pass Rackley Bridge, but at least Mike can still stand up, reach up, and touch it. We did a good bit of wading work as well, pulling logs and branches out of the bottom to make the paddling easy even with abnormally low water. I was in a hurry to leave Saturday, so I forgot to get a photo near the launch. No problem. I’d just drop by for a quick pic on Sunday on the way out to eat. Seemed like a reasonable plan, so that’s what I did. You can see how high up even the pilings for the deck are. What you can’t see are the kayakers I met right at the launch, who told me there was a tree down just downstream of the launch. 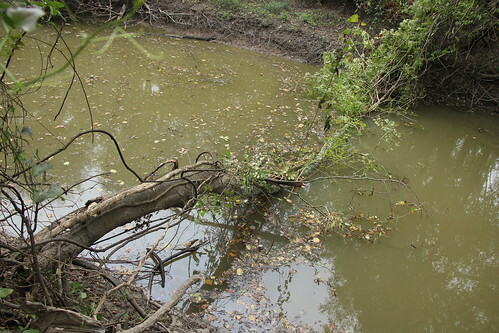 I walked down the bank, and sure enough, a newly fallen tree was completely across the bayou. Fortunately, I had not unpacked my saw and loppers when I unloaded my gear Saturday night, and a kayaker out fishing on the bayou graciously let me borrow his kayak for a quick jaunt. 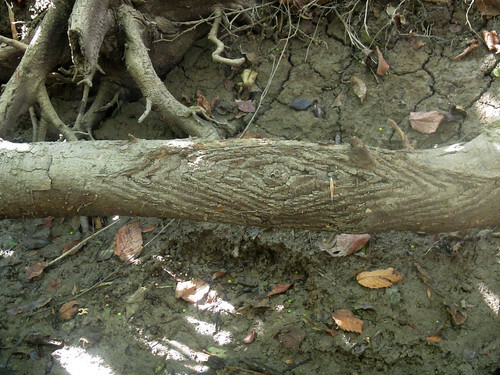 A few minutes later, the whole middle section of the tree was cut out and pulled up onto the bank, and the way was again clear. 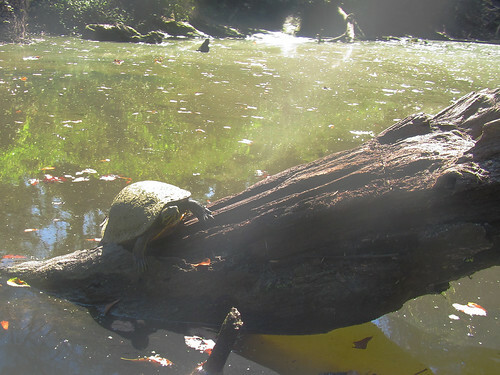 (Thanks, kayaker whose name I forgot.) Apparently, the wind may also have dropped another about two miles down, but whatever that is will have to wait until next weekend when we’re back in our own boats. All in all, it was a fun weekend out on the bayou. We got to see an otter. We got to borrow a stranger’s kayak to dispatch a tree while on the way to dinner. And we’re another weekend closer to the big ribbon cutting for the paddle launch at Highland Road Park. The official time for the ribbon cutting is 2-4pm on Sunday, October 15th, but we’ll be there at the park early and stay late. We’ll be doing free walk-up, no reservations required, mini paddle trips. Just show up, sign a waiver, and hop in one of our boats for a taste of Bayou Fountain (about a mile round trip in either direction, or both if you want more). Should be great. 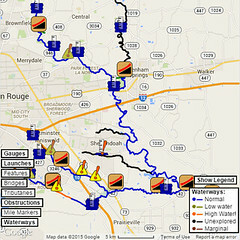 Now if only we can get at least a little more water in the bayou between now and the 15th. ← It’s Our Third-Annual Paddle-In Movie!